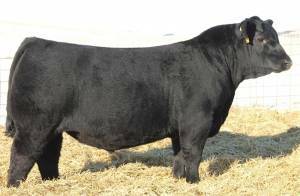 Synergy is in a league all his own, with as much power, presence, and wow factor as you can put in an Angus bull. He is stylish, superfronted with muscle shape, stoutness and a powerful rump beyond compare. He could be the next major factor for siring cattle that can compete at any level. His pedigree is backed by the best cows in the business and his numbers tell the rest. His maternal brother was a top selling feature in the 2013 SAV Sale. His granddam is a full sister to the SAV Blackcap May. This was a favorite of all the visitors from Schaffs this summer.